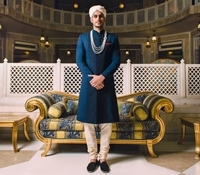 Keeping the wedding season in mind, SS Homme Couture has come out with a new collection of sherwanis, bandhgalas, bandis and tuxedos in mohair, silk and linen. Featuring colours like gold, forest green and cranberry, the line starts at Rs 30,000. Available at the store in Mumbai.